We have analyzed Internet Explorer 11, Google Chrome 41, Firefox 36, Opera 28 and Safari 8.0. Microsoft announced the end of the brand Internet Explorer. He will be replaced by a more amicable settlement with consumers, provisionally known as Spartan. This new era of the browser software giant’s just not constituted an improvement over the last version of Explorer, it will be a new beginning. Spartan, from the technical point of view, not be related to its predecessor. 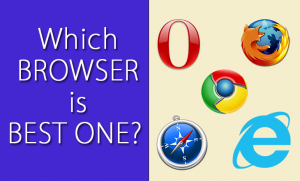 News of Microsoft revived the battle of the browsers. This article focuses on the five main solutions to visit websites that are disputed the throne right now: Chrome, Firefox, Explorer, Safari and Opera. From the viewpoint of market share, Chrome leads the segment of desktops to 52 per cent stake to February 2015, according to StatCounter. What follows Internet Explorer with 20 per cent; Thirdly Firefox ranks with 18 per cent. The last two positions are occupied by Safari, with 5 per cent and Opera with 1.72 per cent. According to the same measurement portal, mobile, the picture varies. Chrome still on top, with 23 per cent of adoption, followed by Safari, with 22 per cent. Thirdly Opera is located, at 10.53 per cent. Internet Explorer is used only by 2 per cent and Firefox, by 0.5 per cent. From the perspective of performance and capabilities, TIME went to various test to determine which is the best browser of the moment. Two tests were run: Peacekeeper, Futuremark signature, resulting in a score that measures the speed of the browser depending on your performance to load pages and the HTML5 Test, which helps determine how prepared is the browser to execute code in that language. Chrome and Firefox offer similar performance. The latest browser from Google (41) ranks second in tests with PeaceKeeper (3,700 points), but is the absolute leader in adopting HTML5 (with 515 of 555 points). Chrome has become the preferred choice of most users for its simple interface, integration with Google services and the enormous range of topics, extensions and applications that you can install to enhance the experience. His greatest weakness: consume more RAM than Firefox, Opera and Safari. Eight tabs open in the browser represent 480 MB RAM. However, this flaw only a problem for computers that have less than 2GB of RAM. Chrome hit the market in 2008 and became the biggest headache of Internet Explorer. One of its strengths is its ubiquity: it operates in all mobile and desktop platforms, from Android to iOS. It is also supported by the most plugins and extensions among browsers, including essential security extensions everyone should use. Firefox hit the market in 2002. It was the first serious rival to Internet Explorer. Its tabbed browsing system, its speed and the possibility of adding extensions made it the preferred choice of technology lovers. Firefox 3.6 is also well prepared to use HTML5 language, although it is a little behind Chrome in this area, with 449 points of 555 possible. It is the solution that less RAM consumes. 260 MB of RAM in 8 tabs As security, version 3.6 resolved about 3,600 errors and ranks as one of the best in that regard. Include its good integration with the Android version as well as its support HTTP / 2 protocol. Safari is ideal for navigating the universe of Apple option. This web browser seamlessly integrates with OS X (for desktops) and iOS (mobile) operating systems. In tests on an iPad Air 2, Safari doubled the score of rival options. The introduction of Safari 8.0, in October 2014, called for significant improvements, such as the inclusion of a smart search bar recommended yielding about what we are visiting pages. It also incorporates an ingenious system for grouping tabs by domain and by category. Likewise, Safari 8.0 improved its integration with social networks: there is a tab that facilitates sharing of content with the social platform of our choice. Version 8.0 added the ability to browse privately (equivalent to Chrome incognito mode and private Firefox window) and polished security. Microsoft does not introduce updates in your browser as fast as its competitors. When Internet Explorer 11 was launched in November 2013, its performance was at the height of the best. Almost a year and a half later, it is located near the bottom of all tests. In PeaceKeeper barely manages 2,470 points and test HTML5 gets 336 points from 555 possible. In other words, it is not ideal to visit websites with the latest technology. Considering these results, it is not strange decision of Microsoft to rethink its approach to the world of web browsers, both in terms of name and functions. Explorer is no longer as insecure as in the past but offers no chance of customization through themes, extensions or applications. Spartan promises significant changes. Opera version 28 provides a similar Google Chrome (3,500 points PeaceKeeper) performance and is the second best in terms of adoption of HTML5 (514 555 points). In terms of interface, is known for its clean, flat, very similar to Chrome design. It also has extensions, themes and applications. However, his portfolio is less robust than their rivals in the field. It is a favourite browser for Android; is highlighted by consuming few computing resources in the mobile version and not so much on the PC, which consumes 400 MB in 8 tabs away from Firefox-. Curiously, in the boot screen has a segment called “Discover” where news are grouped by categories.